Header Front Crop Loss; Can you afford to leave $85,000 in the paddock? Farmers take a great deal of risk and effort bring crop to the point of harvest. In drier years with short patchy crops and lower yields harvest is even more challenging. Grain losses of 10% in cereals and up to 30% in lupins is common. Setting up the combine harvester to reduce grain loss during harvest is well understood. As are modifications to the header front that reduce crop loss during harvest. While these are essential to maximise profit at this critical stage, so we really appreciate the cost of header-front grain loss and what we are leaving in the paddock? Dr Glen Riethmuller highlighted in his article[i] the average crop loss in harvest for wheat was costing a farmer AU$72,000 based on a 4,000ha program. This was wheat at AU$300/t. At AU$350/t[ii] this is AU$85,000 profit left in the paddock! What is each head worth in your wallet? One (1) tonne of wheat is 37 bushels[iv] at approximately AU$350/t. 1 bushel us worth (350 ÷37) = AU$9.46. 38 heads/m2 causes AU$9.46/ acre (or AU$23.36/ha) loss in profit. Each head lost per m2 is costing the farmer AU$1.76/acre (or AU$4.35/ha) in lost profit! Or to put another way, each head saved per square metre in a 4,000ha program adds AU$17,400 profit to the farmer’s wallet. 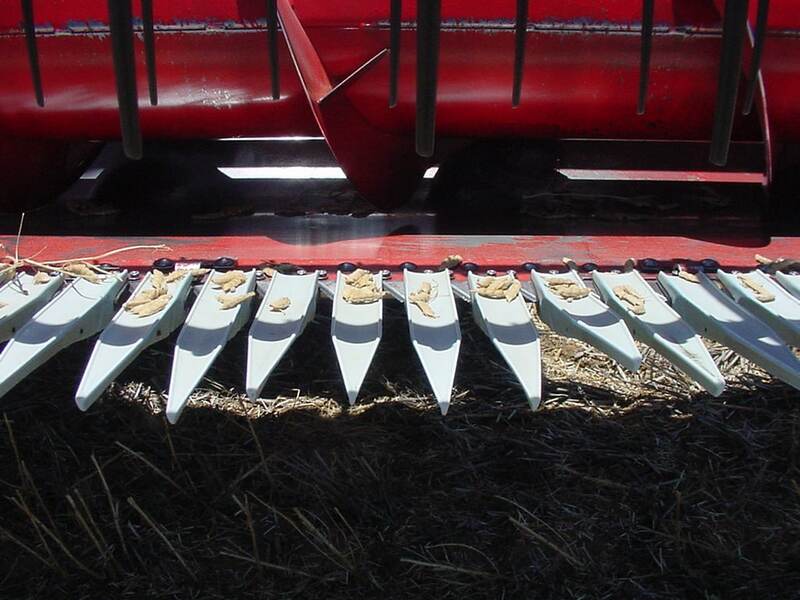 Primary Sales provides the header front modifications of the “Adapt-a-Gap” Knife Guard System and cereal extensions and, where applicable, the “Vibra-Mat” to reduce header-front loss and help “save” seeds. These tools help improve cutting, assist even feed of material, enable the header-front to cut lower and help capture cut material. But how fast would you pay for this investment? Table 1 provides an indicative cost for these header-front modification tools. We can determine how many acres it will take to recover the investment on a set of “Adapt-a-Gap” knife guards, cereal extension fingers and “Vibra-Mat” based on number of heads saved per square metre. Table 2 shows the number of acres/ hectares a farmer needs to farm for wheat (based on 1.4t/ha yield at approximately AU$350/t at port = AU$490/ha). Table 2: Recover investment in how many acres/ hectares? With an average 1.4t/ha wheat crop having approximately 112 heads/m2 and header front loss at 5% to 10%, this equates to 6 to 11 heads/ m2 are being lost. Table 3 illustrates that even in a 5% existing loss situation that a 33% recovery rate (i.e. 2 heads/m2) can generate AU$34,000 in additional profit for the farmer across a 4,000 hectare program of wheat. Even greater benefits will be derived from use of header-front modifications in other popular crops such as canola, lupin and field peas where frontal losses are typically inn the 10% to 30% range. For canola, using a AU$550/t port price and an average loss of 1 bushel per acre and 44 bushels/t. A 4,000-hectare program is leaving AU$50,000 in the paddock. Table 4 shows return in profit through recovering 10%-40% of this loss through “Adapt-a-Gap” knife guards and cereal finger extensions. Crop losses at the header-front is costing farmers much more than is generally realised. As Australian farmers face more frequent drier seasons resulting in patchy, short and light crops, aiding crop recovery will be critical for the survival of some farmers and essential for all others. For further information on Primary Sales “Adapt-a-Gap” knife guards, cereal finger extensions or the “Vibra-Mat” visit www.primarysales.com.au. [i] “How to successfully harvest short, patchy crops”AGRIC, 5 Sept 2017. [ii] All crop costs based on Glencore Agriculture October 2018. Price at port.